Analysis: Monday also marks exactly one month since the police investigation of two incidents at Hill's house became public knowledge. The 25-year-old wasn't listed as a suspect on the recent police report, but he was listed on an older report that was closed shortly after the investigation began. Chiefs coach Andy Reid acknowledged last month that the team has discussed potential responses for different outcomes from the ongoing investigation. Hill is entering the final season of his rookie contract. Coach Andy Reid said the Chiefs' legal counsel has advised him not to speak with Hill about the ongoing investigation for alleged battery of a juvenile at the 25-year-old's home, Terez Paylor of Yahoo Sports reports. Analysis: The incident in question is being investigated by the Overland Park (Kan.) Police Department. 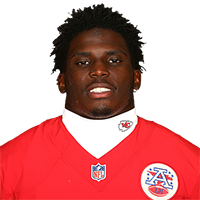 In a statement to The Star, the Chiefs said, "The club is aware of the investigation involving Tyreek Hill. We're in the process of gathering information and have been in contact with the league and local authorities. We'll have no further comment at this time." Once the legal process plays itself out, the team and/or league itself may levy some sort of punishment. Hill has opened negotiations for a long-term contract with the Chiefs, Ian Rapoport of NFL Network reports. Hill caught one of three targets for 42 yards during Sunday's 37-31 AFC Championship Game overtime loss to the Patriots. Hill caught eight of 13 targets for 72 yards and added a 36-yard touchdown run during Saturday's 31-13 win over the Colts. Hill caught four of his nine targets for 74 yards in Sunday's 38-31 loss to the Seahawks. He also added two carries for 17 yards. 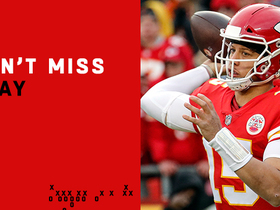 Hill (heel/wrist) brought in four of seven targets for 46 yards, netted minus-5 yards on three rushes and recovered a Patrick Mahomes fumble in the Chiefs' 29-28 loss to the Chargers on Thursday. Hill (heel/wrist) is listed as active for Thursday night's game against the Chargers, BJ Kissel of the Chiefs' official site reports. Analysis: Hill was limited in practice Tuesday and Wednesday after toughing things out through a pair of injury issues in this past Sunday's 27-24 overtime win over the Ravens. He'll continue to do so Thursday and should remain a focal point in the Kansas City offense in Week 15, assuming no in-game setbacks. Hill (heel/wrist) is expected to play in Thursday's game against the Chargers, Adam Schefter of ESPN reports. Hill (heel/wrist) is listed as questionable for Thursday's game against the Chargers, BJ Kissel of the Chiefs' official site reports. Hill (heel/wrist) was a limited participant in Tuesday's practice, BJ Kissel of the Chiefs' official site reports. Hill (heel/wrist) is slated to practice Tuesday, Adam Teicher of ESPN.com reports. Hill (heel/wrist) was listed as a non-participant on Monday's injury report. Hill (foot) is considered day-to-day after an examination failed to reveal any serious issues, Adam Schefter of ESPN reports. Hill dealt with a painful foot/heel injury during Sunday's 27-24 win over the Ravens, Pete Grathoff of The Kansas City Star reports. Analysis: Despite limping off the field in obvious pain multiple times, Hill caught eight passes for 139 yards on 14 targets, including a 48-yard gain to convert a fourth-and-9 on the game-tying drive. He did experience a decrease in snap share to 79 percent, landing below 91 percent for the first time since October. It's a safe bet Hill shows up on the Monday injury report, but his ability to play through the injury Sunday suggests he'll try to do the same Thursday against the Chargers. Hill caught eight of 14 targets for 139 receiving yards, adding one rush for six yards during Sunday's 27-24 win against Baltimore. He left the game on more than one occasion with an injury issue but returned each time. Hill was able to return to Sunday's game against the Ravens after exiting the contest due to a heel injury. Analysis: Great news for the Chiefs, who can ill-afford another injury at wideout, with Sammy Watkins dealing with a foot injury. Hill is questionable to return to Sunday's game against the Ravens due to a heel injury. Analysis: Hill appeared to get hurt on the Chiefs' second possession but proceeded to make 18-yard and 21-yard grabs before halftime. The official ruling from the Chiefs came down at that time, so the wide receiver's status is murky heading into the second half. Hill caught one of six targets for 13 yards, adding two rushes for 37 yards during Sunday's 40-33 win against the Raiders. Hill caught 10 of 14 targets for 215 yards and two touchdowns in Monday night's 54-51 loss to the Rams. Hill brought in seven of 10 targets for 117 yards and two touchdowns and also added 20 yards on his sole rush in the Chiefs' 26-14 win over the Cardinals on Sunday. He netted zero yards on his two punt returns. Analysis: With Sammy Watkins (foot) inactive, Hill unsurprisingly led the Chiefs in targets and parlayed the extra volume into his third 100-yard game of the season and first since Week 6, which also marked his last multi-touchdown game prior to Sunday. Hill's seven receptions were also his most since Week 7, making it a particularly fruitful fantasy performance. The 24-year-old phenom will now set his sights on a marquee Week 11 Monday night matchup versus the Rams in Mexico City. Hill caught four of five targets for 69 yards and added 16 yards on two carries during Sunday's 37-21 win over Cleveland. Hill (groin) doesn't carry an injury designation into Sunday's game against the Browns after logging a full practice Friday, BJ Kissel of the Chiefs' official site reports. Analysis: At the halfway mark of the Chiefs' schedule, Hill ranks sixth in the NFL with 705 receiving yards on 44 catches while reaching the end zone eight times. After proving his health by ending the week without any restrictions, the dynamic playmaker will take aim at a Cleveland defense that has surrendered an average of 275.6 passing yards per game this season. Only six teams have given up more passing yardage to date. Hill (groin) was a full participant in Friday's practice, Adam Teicher of ESPN.com reports. Analysis: The wideout's full session to conclude the week should allow him to avoid an injury designation heading into Sunday's matchup with the Browns. Hill also turned in a full practice Wednesday before turning in a limited session Thursday, but his restrictions that day were likely maintenance-related. He should be fine to handle a full workload in Week 9 against a Cleveland defense that has yielded 276 passing yards per game (seventh-most in the NFL). Hill (groin) was limited at Thursday's practice. Analysis: Hill practiced fully Wednesday, so the dip to a limited session is notable. It remains to be seen if the downgrade in participation was maintenance-related or indicative of a setback. Friday's final injury report in advance of Sunday's game against the Browns will shed added clarity on that front. Hill (groin) practiced fully Wednesday. Analysis: Hill strained his groin late in the Chiefs' 30-23 win over the Broncos on Sunday, but his full participation in the first practice of Week 9 suggest the injury was only a minor concern. The speedy wideout should be ready to handle his usual workload this weekend against the Browns. Hill (groin) is expected to practice Wednesday, Lynn Worthy of The Kansas City Star reports. Analysis: Hill's ability to practice in any capacity suggests he wasn't injured too badly during the fourth quarter of Sunday's 30-23 win over Denver. The Chiefs may want to restrict Hill's practice workload this week, as there's always concern about minor groin or hamstring injuries lingering if the player pushes too hard. Another update will be available later Wednesday when the Chiefs release their initial injury report for their Week 9 game in Cleveland. Coach Andy Reid relayed Sunday that Hill strained his groin late in the Chiefs' 30-23 win over the Broncos, Brooke Pryor of The Kansas City Star reports. Analysis: Prior to his departure, Hill hauled in three of his four targets for 70 yards. The Chiefs should have a better idea regarding the extent of Hill's injury in the next day or two, but the groin issue tentatively puts his status up in the air for Week 9 against the Browns. If Hill is forced to miss any action, added targets could be in store for fellow wideouts Sammy Watkins and Chris Conley and tight end Travis Kelce. Hill suffered a groin injury late in Sunday's game against the Broncos. Analysis: Prior to his exit from the game, Hill caught three of his four targets for 70 yards. Now that he's nursing an injury, the speedy wideout's status is worth monitoring closely as next weekend's game against the Browns approaches. Hill caught seven passes (10 targets) for 68 yards and a touchdown in Sunday's 45-10 win over Cincinnati. Hill racked up 142 yards and three touchdowns on seven receptions (12 targets) in Sunday's 43-40 loss to the Patriots. Hill caught four of seven targets for 61 yards and added 26 yards on two carries during Sunday's 30-14 win over the Jaguars. Analysis: After two relatively quiet games against the 49ers and Broncos, Hill showed a little more spark against a stout Jaguars defense on Sunday. Hill is often a gamble, and you pay a premium in case he goes off with a big receiving day with his speed. Sunday was a step in the right direction after a mini-slump, but a matchup with New England should bring its own challenges as, despite some warts, the Patriots defense ranks in the top 10 in limiting opponents' yards per reception. Hill caught nine of 13 targets for 54 yards in Monday night's 27-23 win over the Broncos. He also rushed once for two yards and returned a punt 37 yards. Analysis: Hill led the Chiefs in both receptions and targets, setting season-high marks in the process, yet was relatively well contained by the Broncos defense. Besides his long punt return, Hill's biggest gain Monday came in the form of a 15-yard catch, which paled in comparison to his average grab of 22.1 yards entering the contest. While Hill is seemingly always primed to explode, his Week 5 matchup against the similarly spectacular Jaguars secondary should make for quite the confrontation. 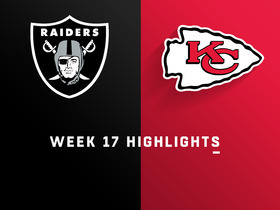 Hill brought in two of five targets for 51 yards, rushed twice for five yards, returned a punt for five yards and recovered a fumble in the Chiefs' 38-27 win over the 49ers on Sunday. Analysis: Hill finally came back down to earth to an extent, although he still logged a 42-yard reception. His targets did drop for a second straight week, as Patrick Mahomes honed in on Travis Kelce and Sammy Watkins frequently. Hill will undoubtedly fall victim to game plans designed specifically against him, but his elite speed will keep him a high-upside play regardless of matchup and format. He'll look to bounce back against the Broncos in a Week 4 Monday night divisional battle. Hill hauled in five of six targets for 90 yards and a touchdown during Sunday's 42-37 win over the Steelers. Analysis: Hill kept the good times rolling for Kansas City early in the fourth quarter, splitting two defenders for a 29-yard touchdown on a Patrick Mahomes dime. The Mahomes-Hill connection, featuring Mahomes' arm strength and Hill's speed, should terrify opposing defenses. Hill has three touchdowns and is averaging 21.6 yards per catch to start the season. Hill caught seven of eight targets for 169 yards and two touchdowns while also scoring on a 91-yard punt return in Sunday's 38-28 win over the Chargers. Hill caught all eight of his targets for 88 yards in Saturday's preseason game against the Bears. Hill caught all four of his targets for 87 yards and a touchdown in Friday's preseason game against the Falcons. Hill and the Chiefs' starters on offense are on track to play all of the first half of Friday's preseason game against the Falcons. Analysis: The speedy wideout is thus poised to get a full half of live action to gel with first-year starter Patrick Mahomes, marking his first significant game reps with Mahomes since the QB officially took over under center this offseason. The second-year signal-caller represents a significant upgrade in terms of arm strength over Alex Smith, so he may be able to better take advantage of Hill's ability to take the top off of defenses. Hill (ankle) returned to the practice field Tuesday, the Chiefs' official site reports. Analysis: Hill missed practice last Thursday after twisting his ankle, but he appears to be fine after giving it a couple days of rest. The issue shouldn't prevent him from participating in practices moving forward as Hill looks to build his rapport with second-year quarterback and first-year starter Patrick Mahomes. Hill was held out of Thursday's practice with an ankle injury, BJ Kissel of the Chiefs' official site reports. Analysis: Hill reportedly twisted his ankle in a prior practice, but there doesn't seem to be much concern surrounding the star wide receiver's health, and his absence Thursday was likely just precautionary. It wouldn't be surprising if the team limited Hill or even held him out of OTAs entirely to ensure he doesn't do any further damage to the ankle before training camp. Hill caught seven of 11 targets for 87 yards and added a 14-yard carry in Saturday's 22-21, wild-card round loss to the Titans. Hill (coach's decision) is officially inactive for Sunday's Week 17 tilt against the Broncos. Analysis: The designation is a mere formality, as Hill's expected status had been announced Friday. The speedster's absence Sunday will afford Albert Wilson No. 1 receiver duty, while the likes of Demarcus Robinson, Jehu Chesson and De'Anthony Thomas will help round out the receiving corps for rookie signal caller Patrick Mahomes in his first NFL start. Hill (not injury-related) won't play Sunday against the Broncos, BJ Kissel of the Chiefs' official site reports. Analysis: The Chiefs are locked into the AFC's fourth playoff seed, so Hill, as well as QB Alex Smith -- among others likely -- will not play in Week 17. As a result, look for the likes of Demarcus Robinson, Jehu Chesson and De'Anthony Thomas to see added wideout reps in Week 17. They'll be catching passes from rookie QB Patrick Mahomes. Hill brought in six of seven targets for 109 yards and netted minus-1 yard on his sole rush in Sunday's 29-13 win over the Dolphins. He also gained one yard on his sole punt return. Analysis: Hill wasn't able to get into the end zone, but his reception and yardage totals both paced the Chiefs and he was able to make multiple catches downfield. The second-year speedster also eclipsed the century mark through the air for the second time in the last four games, and his total haul helped push his career-high receiving yardage total to 1,183. Hill will look to finish the regular season with a flourish and help Kansas City's playoff positioning against the Broncos in Week 17. Hill caught five of six targets for 88 yards and a touchdown during Saturday's 30-13 win over the Chargers. Hill corralled four of six targets for 75 yards in Sunday's 26-15 win over Oakland. Analysis: Hill's biggest play was a 44-yard catch in the first half. He made three catches of at least 40 yards last week, so the speedy second-year player has found the explosiveness that had been missing during his team's recent slide down the standings. Tight end Travis Kelce saw 13 targets to Hill's six in this one, but the wide receiver finished with one more yard to lead the team. Hill caught six of nine targets for 185 yards and two touchdowns in Sunday's 38-31 loss to the Jets. Analysis: Hill finally made the most of his recent increase in volume, as he got free deep for a 79-yard touchdown in the third quarter before scoring a go-ahead 40-yarder in the fourth. His previously dormant big-play ability emerged again on a 40-yard catch later in the fourth, but those plays still weren't enough to snap Kansas City's losing streak, which now sits at four games. Hill caught seven of 11 targets for 41 yards while rushing twice for 13 yards in Sunday's 16-10 loss to the Bills. 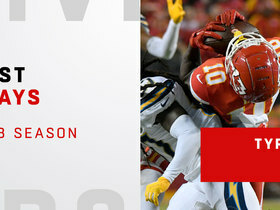 Analysis: The stagnating Kansas City offense did a good job of getting the ball into Hill's hands, as he easily led the team in targets while tying his season high of seven catches for the second consecutive week. He wasn't able to turn any of those looks into big plays, however, gaining no more than 11 yards on any of his catches while being held below 50 receiving yards for the fifth time this season. Hill caught all seven of his targets for 68 yards and added a 16-yard carry in Sunday's 12-9 overtime loss to the Giants. Analysis: The explosive Hill never found the room to put his team over the top with a huge play, as a 38-yard catch represented his biggest gain of the day. 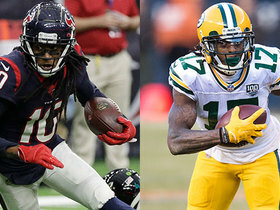 He's been largely held in check as of late, tallying less than 70 receiving yards in six of the past seven games. Hill caught two of four targets for 64 yards and a touchdown during Sunday's game against the Cowboys. He also carried four times for nine yards in the 28-17 loss. Analysis: Hill was held in check for the most part, but he provided one of the top highlights of the day with a weaving 56-yard catch and run for a touchdown just before half time. His four carries were a season high, but he found hardly any room to run. Hill continues to see a handful of touches per game, but he's become fairly reliant on big plays for fantasy production. This should remain the case against the Giants in Week 11, after the upcoming bye. 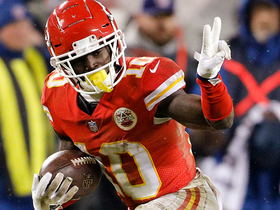 NFL Network Insider Ian Rapoport reports the latest on the Kansas City Chiefs' contract negotiations with wide receiver Tyreek Hill. 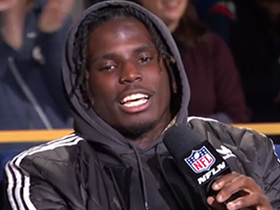 Kansas City Chiefs wide receiver Tyreek Hill joins "Super Bowl Prime" and discusses the 'mastermind' coach who's helped him evolve in NFL. 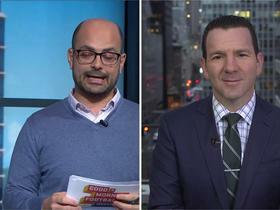 NFL Network Insider Ian Rapoport has the latest on the Kansas City Chiefs offering long-term deals to key players. 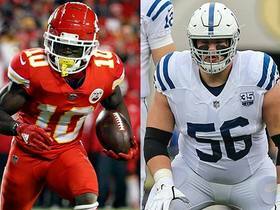 The "Good Morning Football" crew discusses if Indianapolis Colts offensive lineman Quenton Nelson or Kansas City Chiefs wide receiver Tyreek Hill is the scarier offensive player. Kansas City Chiefs quarterback Patrick Mahomes throws a 67-yard touchdown pass to wide receiver Tyreek Hill. 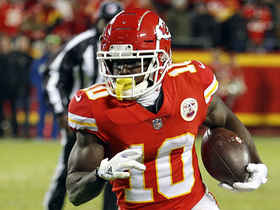 Kansas City Chiefs wide receiver Tyreek Hill rushes for a 15-yard touchdown.